Into every life a little rain must fall and in Husbands and Wives, Woody Allen summons a sizable storm. The inclement weather take many forms in Allen's new and much talked-about film and Rain (Juliette Lewis) is just one of the cloud formations in this documentary-style look at the aftermath of one couple's decision to split. Jack and Sally (Sydney Pollack and Judy Davis) start a chain reaction when they tell their longtime friends Gabe and Judy (Allen and Mia Farrow) that, after 15 years of marriage, they plan to separate. That announcement causes upheaval for all involved, forcing Jack and Sally to re-enter the singles scene and Gabe and Judy to re-evaluate their own relationship. Jack pursues a relationship with a New Age aerobics instructor (Lysette Anthony) while Sally gets fixed up with Judy's co-worker Michael (Liam Neeson). Secretly, Judy pines for Michael herself while Gabe becomes attracted to one of his students at Columbia, the 20-year-old Rain who reminds him of a long lost love. While similar to other Allen works, Husbands and Wives diverges from his usual path in terms of its language and, at times, its harsh, unblinking ugliness. The film chronicles these events not only by showing them but through conversations the characters conduct with an off-screen interviewer. The movie never explains this device and much of the film begs questions about the movie's intentions as well. Allen films most of Husbands and Wives with a hand-held camera that darts around rooms like a camcorder being used for the first time by a technologically inept man after the birth of a grandchild. The desired effect doesn't quite work because instead of the jerky movements subliminally mimicking the chaos on screen, it simply distracts from the content. While few screenwriters produce as much good dialogue as Allen and he's shown success at varying script structures, each time he embarks on something adventurous in terms of direction, it comes off more as a stunt than as the proper way to convey his story. As usual, Allen wears his symbolism on his sleeve. He not only creates a lightning storm for a pivotal scene but makes a point of explaining its significance to the audience. When he delicately suggests that time is the true enemy of all relationships, Husbands and Wives works. Too often though he beats the audience over the head with his points. The subtle moments though work, especially those dealing with truths and half-truths that cause people to be uncertain of what they know. Pollack delivers a solid performance as the blustery Jack who finds himself drowning in his own midlife crisis. Lewis fulfills much of the promise she displayed in Cape Fear as the tempestuous Rain, getting many of the film's best lines and scenes, especially in a sequence that visualizes what she thinks as she reads Gabe's unpublished novel. 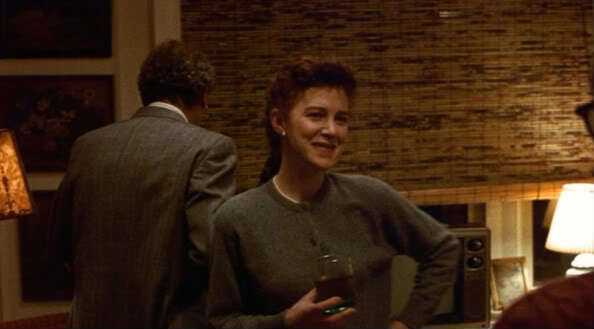 Without question, the remarkable Judy Davis earns the prize for cast MVP as the hyper and aggressive Sally. She was robbed of Oscar nominations last year for solid supporting work in David Cronenberg's Naked Lunch and the Coens' Barton Fink and for her lead role in Impromptu, but hopefully this performance will garner a stream of awards. As for Allen and Farrow, Woody is, as always, Woody, and Farrow, who has done her best work with Allen, comes off as somewhat sad and pitiful in a role that makes her unsympathetic. Given recent events in Allen and Farrow's real life, it's impossible not to read things into much of the dialogue and situations. Despite that, Husbands and Wives hits some universal nerves. Though it fails to live up to Allen's best works, it still deserves a look.